CTBaker in the Acres: Bring on the green!!! 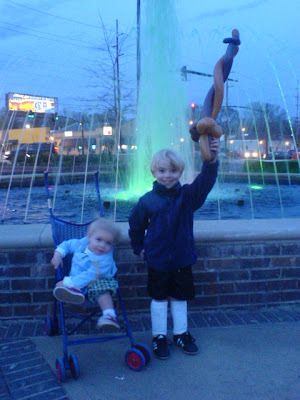 Friday night, after Sam's soccer practice, we went down to the fountain in Five Points. Each child was given the opportunity to dye the fountain green. They had beads and stickers, a leprechaun, and bag-pipers, but the hit was the Balloon man. He was the best I've ever seen. Although, we missed the actual dying of the fountain, we still enjoyed bumping into a few friends and watching the balloon man. Sam chose a not-so complicated sword. I'm sure it was a relief after the extremely intricate lion and elephant he had made just before he got to us. We treated Sam to pizza at Za's for doing such a great job at soccer and concluded our evening! It was nice to catch up with the Bakers. We were at the fountain Friday night. It was kind of early and did get to dye it. Crazy!! Sorry we missed y'all. I feel like it's been forever since we've seen you. I had thought about doing an Easter egg hunt. What do you think? We need a girls night here sometime soon. Let's try to get Jenn out. Where do you get all your energy. I'm getting a kick out of all your full-on-family-activities.